Did you know the photo screen savers in Mac OS X are interactive and can turn into slideshows? 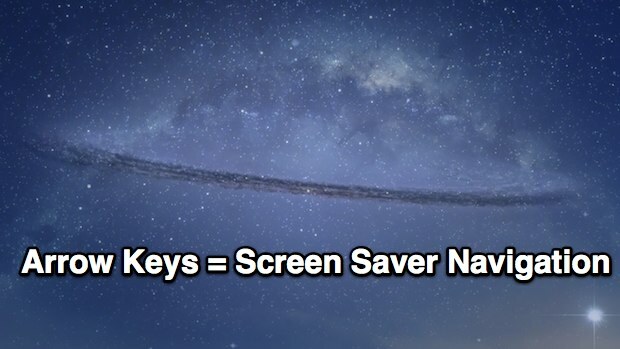 There’s really not a lot to this trick, just activate any of the Mac screen savers that rely on images and then use the left and right arrow keys to navigate forward and back between images in the screen saver, with a nice transition between them. It’s hard to visualize this with a picture and best tried yourself, but the picture below shows the transition between two images as induced by the arrow keys. This works in all of Apple’s provided image-based screen savers in OS X, and perhaps much more usefully, in screen savers you make yourself out of photo collections stored in Finder folders or iPhoto albums. For use as a slideshow, this is best done with the full screened screensavers like Ken Burns and Classic, but it does work in all of the new default image screen savers, even Photo Mobile, Photo Wall, and Shifting Tiles, though for the latter it flips through individual tiles rather than switching the entire display. Try it out yourself, or use the navigation arrows the next time your screen saver passes a picture you want to get a second look at. Agreed, I find that a little strange. Pause actually let it work as a slide show, now we can just skip around. Seems like an unnecessary feature removal, doesn’t make a lot of sense. The example picture used in this is beautiful. Any chance of a link to a high-res one for use as a wallpaper? I have snow leopard, ox10 and have an on=going slide show from my iPhotos file. Pictures go by and the forward/back arrows do not move them along if I want to revisit the photo on the screen. what else can I do?